Did you have a wonderful weekend? I loved looking at how all of you were doing all weekend through Instagram. We didn't really do much which was utterly fantastic. Our weekend consisted of Saturday crepes for breakfast. I am so happy I found that recipe months ago through Kristine because crepes are now a Saturday morning tradition. We sit around the table and make our own little masterpieces with all the fixin's and then talk about our good and not so good parts of the week. We go around the table and talk about what was great and then not so great. It's such a good bonding part of our weekend. We pretty much did nothing but veg in front of the tv, watching Charmed with the kids and then headed out for dinner at one of our favorite Korean restaurants in our area. We got our fill of bulgogi and dumpling soup and then headed to the park across the street. It was a great first day of the weekend. Today is Monday...and I know we all hate to get back to our responsibilities of the week, but I'm just happy that it's a short work week. I'm also just happy. Happy to be writing about what I want and not worrying about what's popular in this blogland. I saw a pin on Pinterest last night before I went to sleep and it really struck a cord with me. I've been worrying way too much lately about this blog and what I want it for. Then I saw that pin and it reminded me why I write here. 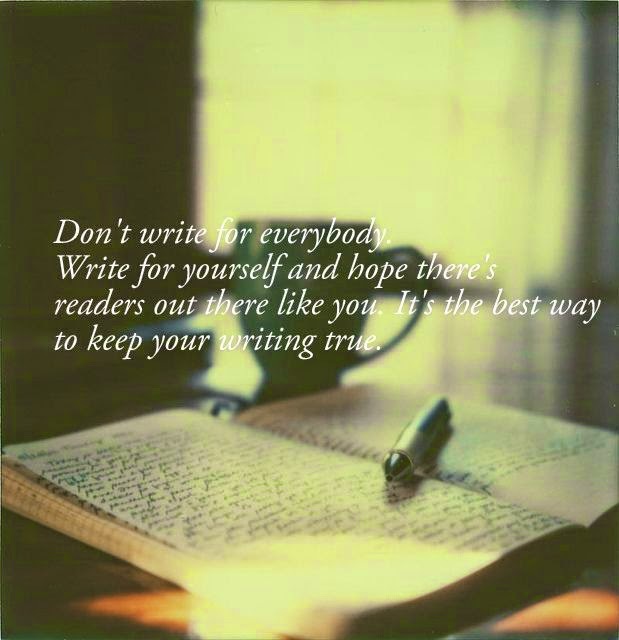 I write because I love to do it. This blog is such a big part of me. Putting down words and sharing my little life with all of you is what matters. I have decided to stop being jealous of others. Yes, I've been jealous. Jealous that other bloggers have a larger following than I do or that they seem to have it altogether with the blog writing thing or that they seem to always have something good to write or that they have a lot of comments, etc, etc. Well it's foolish of me to do that. It seems like so many other bloggers have it better than I do. But that's it....it SEEMS like they do. But, the truth is, we all have our own successes - some are bigger than others, but they are still successes. So, I'm going to just focus on that goodness. That goodness that says that I have the ability to write and to connect with my readers. At the end of the day, that's what I want my legacy in the blogworld to be. A place to share me. A place where I connect with other women. A place where I tell you about my weekend and you actually take the time to read it. You read it because you care about this place as much as I do. Have a beautiful day, loveys. I LOVE that you're just talking "to me". I really feel like you are talking to me personally. Never change.